Has your lawn become dull and lifeless over Winter? We've found the perfect solution to having green lawn all year round. ColourGuard, is a natural plant based turf colourant that is environmentally friendly and 100% organic that helps keeps your lawn looking its best no matter what mother nature throws at it. ColourGuard is designed to give you the best looking lawn on the street all year round. It is a natural organic grass colourant that strengthens and protects lawn under extreme conditions and instantly restores the colour by providing natural green pigment back into the grass leaf. Don't be mistaken, ColourGuard is not a lawn paint but rather an organic pigment that is absorbed naturally by the grass leaf blade. This means that it's perfectly safe for children and pets! 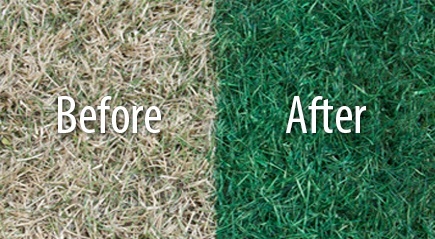 ColourGuard is the best and easiest option in re-introducing a permanent green pigment back into natural grass blades. We couldn't think of any reason why you shouldn't use ColourGuard. 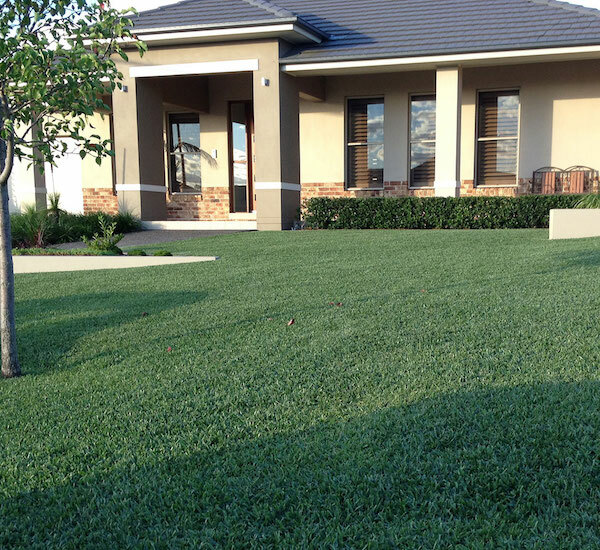 It's no secret that a lush green lawn in your landscape can increase your kerb appeal and increase the sell value of your property by 10%. However, lawn may suffer through the frosty Winter or the drought of Summer. Not only can ColourGuard bring back the lush green properties of lawn, it also acts as sunscreen for your lawn by filtering out the harmful UV rays whilst still allowing light to hit the leaf blade. Restore your lawn to its glory with ColourGuard and ensure your lawn is looking at it's best for any event. ColourGuard is so fast and easy to apply, your lawn will be guest-ready in no time. Attach your hose to the 2 Litre Ready To Use bottle, or mix the 100ml concentrate with water in a pressure sprayer as per the bottle instructions. Spray evenly across your lawn, working from methodically from one side to another. When spraying near hard surfaces like paths and driveways, stand on the surface and spray the ColourGuard away from the surface onto your lawn. If you accidentally spray onto a hard surface, simply wash the spray off into the lawn using hosed water. Once you have applied ColourGuard, give it 2 hours to dry in full sunlight, or longer if the lawn is not in full sun. You can mow your lawn after using ColourGuard has dried – just don’t set the mower too low and scalp your lawn. 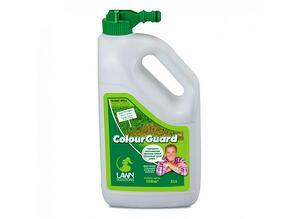 ColourGuard is a permanent colourant, so it will only disappear as the grass leaf grows. Don’t worry if it rains – ColourGuard is not washed off by rain or water, once it has dried.